Claudia Maluenda was born in Santiago de Chile. Having fled the violent putsch in 1973, her family lived in political exile and Claudia grew up in Lima, Paris and Algiers. Later she moved to Berlin to study, and it’s here that since 2002 she runs “Ladoré Arts” and the “Salon Culturel Ladoré”, which synthesise her choreographic, dance and musical work. Her fourth album is the realisation of long-held plans and a departure from her previous work. As a wanderer between countries and cultures, she learned to feel at home in this bright, yet melancholic music. The newly and individually interpreted classics on “Chansons – toujours Ladoré” are dedicated to Claudia’s French friend Marie, who had helped the family with the difficult new start. Claudia’s sensitive voice and the poetic lyrics of the newly arranged songs tell magic-realist stories filled with tenderness, longing, sorrow and joy. Founded by Claudia Maluenda in Berlin the band has worked with international musicians from Latin-American countries, particularly Chile, Peru, Cuba and Argentina, and with guests from Europe since 2002. Under the artistic direction of singer, dancer and choreographer Claudia Maluenda the musical variety of their diverse programmes spans soulful, thoughtful chansons, contemporary interpretations of Jazz, Bolero and Bossa Nova titles, Cuban Son, Salsa and Tango as well as folk and protest songs. The programmes “Latinoamérica, mon amour...” (Vol. I), “Peces en el Rio- transcontinental Christmas music” (Vol. II) and “Sentimiento, Protesta y Amor” (Vol. III) have been recorded on CD and are available for purchase. In her first programme “Latinoamérica, mon amour...” (Vol. I) Claudia Maluenda and her musicians fused two characteristic genres - French Chanson and the diversity of Latin-American music - into a novel musical experience. With her sensitive voice and poetic lyrics Claudia Maluenda told tales of “real-magic”: they enchant audiences with tenderness, yearning, sorrow, happiness and passion, all at the same time. The second CD “Peces en el Rio- transcontinental Christmas music” (Vol. II) as well as the new CD “Sentimiento, Protesta y Amor” have been developed together with the Chilean composer, arranger, guitarist and singer Rodrigo Santa Maria. “Peces en el Rio” has repeatedly been performed as part of Ladoré Arts’ Christmas shows. Further performances have taken place at Festival Liederflut in Grimma, Festival Sommerklänge at Stift Neuzelle and in the Academy of Arts Berlin amongst others. The memory of an irretrievable past, the loss of a familiar home, flight and displacement, the difficulties of beginning a new existence, and adapting to an alien reality while conserving one’s identity have been the leitmotifs of many biographies throughout history. Current events move people worldwide. For Claudia Maluenda they stir memories of her own childhood and youth. Persecuted by Pinochet’s military dictatorship that violently overthrew the democratically elected government of president Dr Salvador Allende, her family had to flee her home town of Santiago de Chile in 1973. At first their flight led them to Lima in Peru, her father’s home country. Then their formative “Odyssey” led them through Paris, Algiers and at last back to Peru during the difficult 1980s before returning to Santiago de Chile when the dictatorship had ended. Claudia Maluenda started her own family in Berlin and since completing her studies she has worked as a freelance dance artist and singer in concerts, dance and musical productions. 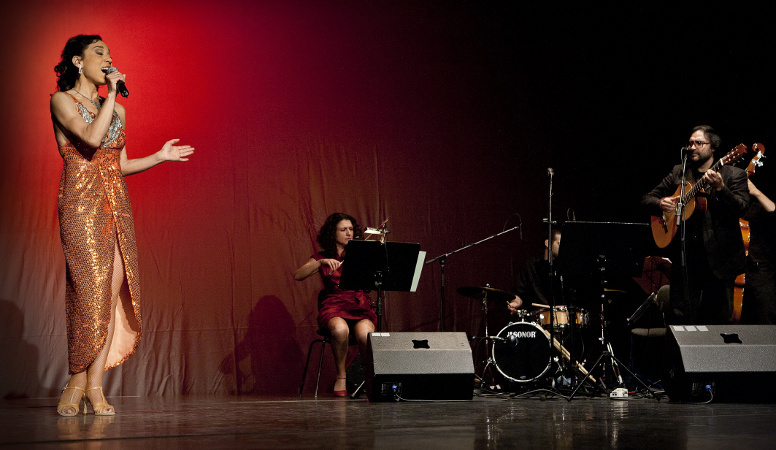 Since 2002 she directs “Ladoré Arts”, a synthesis of her choreographic, dance and musical work. In her ballet studio she hosts “Salon Culturel Ladoré”, a series of social and cultural events, and provides dance classes and artistic training for children and teenagers. This is a CD about not forgetting. Claudia Maluenda dedicates it to her family in Chile and Peru, to her friends and to all victims of the Pinochet dictatorship who were tortured, “disappeared” or died, to all who are today suffering from injustice and to all who fight against it. “I sing songs, that have accompanied us in the years of our flight and that have helped us conserve our identity, that tell of the good and bad in life and of humanity and justice.” “Gracias a la vida, que me ha dado tanto… thanks be to life that has given me so much”. Claudia Maluenda & Canción Ladoré present "Peces en el Rio"
“Peces en el rio” is a seasonal programme unlike any other, celebrating cheerfulness, whilst evoking thoughtful contemplation. Traditional songs meet with less known mystically festive songs. The choice of songs mirrors the international band and the singer’s roots in different places all over the world. New sounds and worlds are shared with the audience, evoking the feeling that throughout the world the celebration of Christmas expresses an everlasting yearning for happiness, love and togetherness. In their diverse programme "Latinoamérica, mon amour…" Claudia Maluenda and her musicians fuse two characteristic genres - French Chanson and the diversity of Latin-American music - to a novel musical experience. Claudia Maluenda’s sensitive voice and lyrics full of poetry tell tales of "real magic": they enchant audiences with tenderness, passion, sorrow, happiness and yearning, all at the same time. The musical range includes soulful, reflective chansons, newly interpreted jazz, bolero and bossa nova, salsa, son and tango titles as well as dance music. Repertoire "Latinoamérica, mon amour ..."